These days corporations are marketing their products to children at all levels of schooling, even preschools. Food companies spend $1.8 billion each year marketing to young people and about 82% of schools have corporate ads. Everything from school buses to gymnasiums to textbooks is plastered with corporate ads. Fast food companies come to schools promoting literacy and fitness, but are really aiming to sell their products and build brand loyalty from an early age. Personally, I don’t buy into the idea that McDonald’s is really trying to promote fitness programs in schools and isn’t merely using that façade as a way to reach its desired audience where it can’t escape. There are several different ways corporations can get into schools. Direct advertising such as ads placed on school walls or buses is a main way. Schools receive cash compensation for these kinds of ads, which most schools believe they are in need of. Another way schools think they can try to save money is with the sponsorship of materials for the classroom. A decrease in public funding for schools has left 35 states with 2012 funding below 2008, which means that school districts must make up the difference somewhere. These corporate contracts are attractive to them in this regard. Schools are receiving cash compensation for displaying the ads or getting free sponsored educational materials that contain company logos prominently displayed. This is another primary way corporations get into classrooms. Most of these materials are not reviewed for their content. In one study, 80% of corporate-sponsored classroom teaching materials were found to be biased or incomplete while also promoting the sponsor’s own products. Some schools with limited resources have begun seeking out these offers from companies, but most find that their earnings from them are insignificant. For example, schools that sign contracts with soft drink companies are receiving as little as $3 per student in exchange for a monopoly on selling and advertising their beverages on campus. 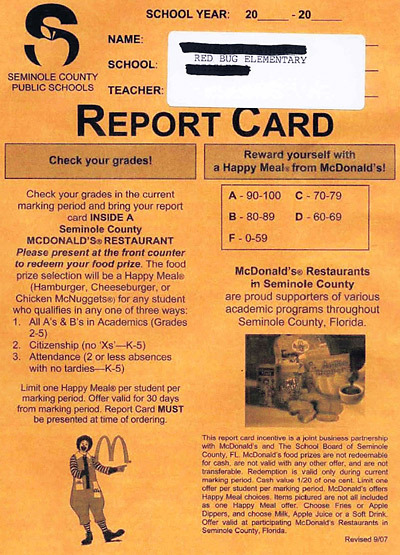 It was also shocking to me to find out that in Seminole Country, Florida, report cards were sent home in McDonald’s branded envelopes and promised a free Happy Meal for good grades, behavior, or attendance. Blatant attempts like this to market products to students are doing a great job of promoting unhealthy eating habits. They encourage children to eat fast food or junk food and consume sugary soda drinks. 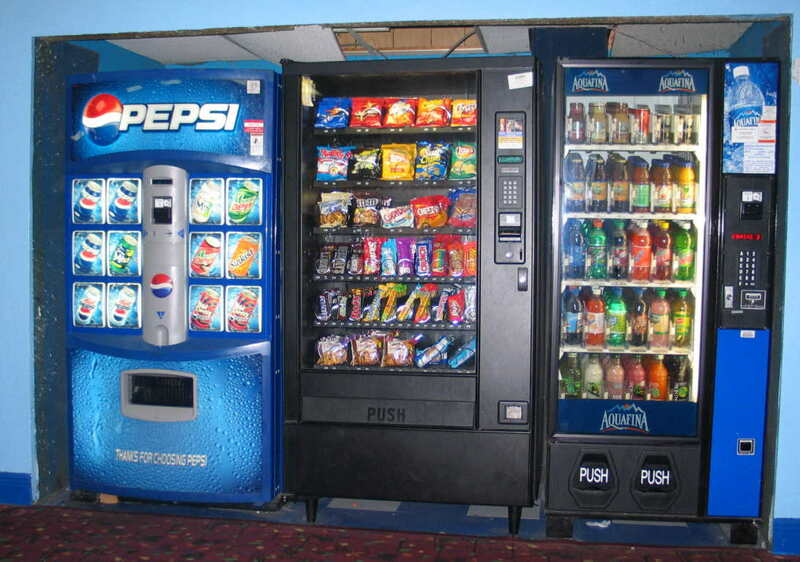 Many schools have exclusive beverage contracts (EBCs) with corporate companies that give them exclusive access to all vending machines at the school. The amount of high schools which have these contracts has dropped between 2007 and 2012, but is still at a whopping 70%. Also, around 51% of high school students had company-sold food vending readily available to them and 30% had fast food available at least once a week. For elementary schools, food coupons were the most frequent type of commercialism found in one study, and those, as well as EBCs, were more present in schools with a low or middle class student socioeconomic status which probably relates back to the fact that these schools are the most underfunded and need to find money elsewhere. Contests and incentive programs are also a big way that advertisers get into schools. Many times the incentive and the prize involve more consumption of the company’s product. Profit is their motivation, not caring about children’s education. The problem with marketing in schools is that most people believe that this is the one space in a child’s life where they can escape the commercial and material deluge that overruns our society. It also brings up an ethical question about who owns and runs public schools. Giving corporate sponsors this much control over curriculum and resources basically allows companies to own the future of children’s education. Do we really want a world where kids grow up being even more consumption-oriented than they would be without getting extra marketing in school? Do we want them to develop brand loyalty to fast food corporations from a very young age that promotes unhealthy eating and fosters a culture of obesity? Given all of these negative aspects of marketing to children in schools, a recent initiative by First Lady Michelle Obama has tried to focus on marketing healthy food to youths. While her intent is certainly in the right place, the execution is leaving many critics unsatisfied. Instead of getting media corporations to stop marketing junk food to young children (an arguably colossal task), she has decided to get some corporations to pledge to market healthy food instead. Public health advocates criticize this program however, because they believe marketing to children needs to stop altogether rather than these polarized campaigns that just lead to greater amounts of overall ads bombarding kids. Despite the First Lady’s best attempts to reform the eating habits of young kids, the people with the power to do so seem to be having a hard time going against the big junk food businesses. Federal reform that was supposed to raise nutrition standards for how food is marketed to children fell apart in 2011 and has not been brought up again since. But, as critics say, focusing on changing the nature of these marketing campaigns takes away from the actual problem that is the fact that kids are being used as giant money-makers for large corporations. Corporate interests are being placed about children’s health and education and that needs to change.